and audio more affordable and accessible. This product is specially designed with equalizer IC in its input and drive IC in its outputs. 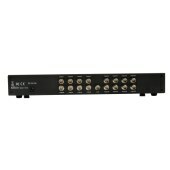 All of the input and outputs support long coaxial cable. Support wide range data rates：270Mbps~2.97Gbps.